It was 1938 and Romy Bernfeld was forced to flee Vienna with her parents after the Nazis began rounding up Jewish residents. Shanghai was a different city completely – bewildered and afraid, Romy found friendship with a neighbour, Li and her brother, while Romy’s mother was shattered and depressed. Her father, a doctor, began working at the local hospital. Gradually Romy found her way around the French Concession where they lived. But with the Japanese invasion, everything changed once again. Alexandra Laird had returned to Melbourne, Australia to be with her Opa who was dying. It was 2016, and the thought of losing him devastated her – he and Oma (Wilhelm and Romy) had been there for her for as long as she could remember. Alexandra had no idea how she would cope when he was gone. Her transfer to Shanghai with work felt fortuitous – she could research her grandparents’ past while there. Oma had told her very little of what had happened during the war years. 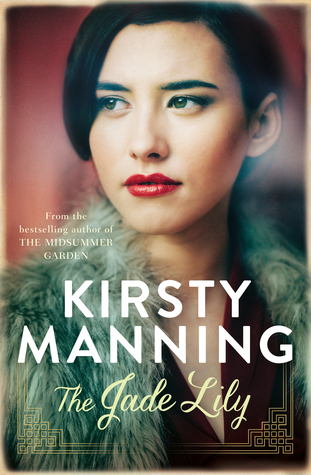 The Jade Lily by Aussie author Kirsty Manning is my first by this author, and it won’t be my last! A thoroughly enjoyable historical fiction novel which was set mainly in Shanghai, with the narration in two timelines by both a young Romy and Alexandra; I couldn’t put it down. Heartbreaking, filled with hope, a lifetime of friendship, and masses of courage, The Jade Lily is one I highly recommend – 5 stars. With thanks to Allen & Unwin for my uncorrected proof to read and review. This entry was posted in Book supplied by publisher or author for review, Guest Reviewer, Historical Fiction, Post Script: Book Reviews and tagged #Aussie Author, #Brenda, 5 star read, aussie author challenge. Bookmark the permalink.